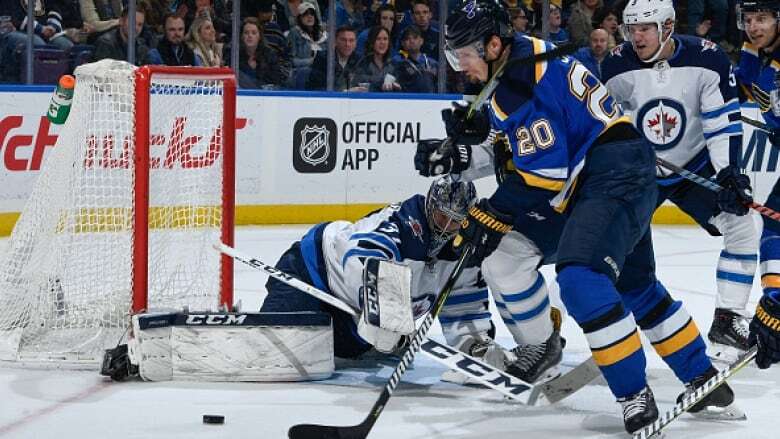 Connor Hellebuyck made 34 saves for his sixth shutout of the season and Blake Wheeler and Kyle Connor each had a goal and an assist in the Winnipeg Jets' 4-0 victory over the St. Louis Blues on Friday. Connor Hellebuyck shut down the St. Louis Blues — again. Hellebuyck made 34 saves for his sixth shutout of the season and Blake Wheeler and Kyle Connor each had a goal and an assist in the Winnipeg Jets' 4-0 victory Friday night. Hellebuyck has three shutouts in six career games against St. Louis. "They're nice and gritty and I think we like that style of game," Hellebuyck said. "We like to get in the mud and really work and grind teams down and I think they fit right into game role." Nic Petan and Patrik Laine also scored to help the Jets win for the fourth time in five games. Jake Allen made 19 saves for the Blues. They are 0-4-1 in their last five. "Just too many mistakes throughout 60 minutes, including myself," Allen said. "You see the turnovers against a top team like that with tons of speed and they shoved it back down our throats pretty quick. We need to limits those and tonight it just kind of snowballed on us." The Jets, with 81 points, have a solid grasp of second place in the Central Division. The Blues, with 72 points, could lose their hold of the second wild-card spot in the Western Conference with a Los Angeles or Calgary win Saturday. The Jets scored twice in a 44-second span midway through the first to take control. Petan took advantage of Chris Butler's giveaway with 9:56 left in the first period. Mark Scheifele intercepted a poor clearing attempt by Butler and found Petan. Wheeler made it 2-0 from an awkward angle against Allen, who gave up two goals on the first four shots he faced. The goal extended Wheeler's scoring streak to seven games. "They came out strong, I thought we came out a little flat," Wheeler said. "Bucky kept us in it and they had a turnover there and it kind of got us rolling, got us on the board. We started flowing a little bit from there." Connor made it 3-0 with a power play goal with 1:29 left in the first, chipping in a rebound off of a Wheeler shot. Connor has scored four goals in his last three games. "We turned a couple of [pucks] over early and then one of our offensive lines got in the penalty box and he [Hellebuyck] made some saves on that PK that was good and gave us time to get our legs going," Winnipeg coach Paul Maurice said. Laine extended his goals streak to four games, beating Allen clean from the right circle at 6:04 of the second period. "I thought we came out with good jump," Blues forward Alexander Steen said. "We let in a couple of goals and dug ourselves a hole. I think we were a little spread out against a solid team. They play with good foundation to their game and we got extremely spread out at times during the game." Hellebuyck made several key saves early as the Blues had the first seven shots of the game. Hellebuyck also made tough saves on Brayden Schenn and Steen during a power play late in the second. "Yeah, you know, hats off to the guys in front of me," Hellebuyck said. "They've been blocking shots and giving me sight lines. Their details are so good. I hope we never have to talk about the other way around. Let's keep it playing this well and I can keep telling my players that they're playing phenomenal in front of me."